The University of Wisconsin at Milwaukee conducted a series of field-testing studies and determined that this bridge treated with crystalline technology showed dramatically reduced chloride content compared with control structures. 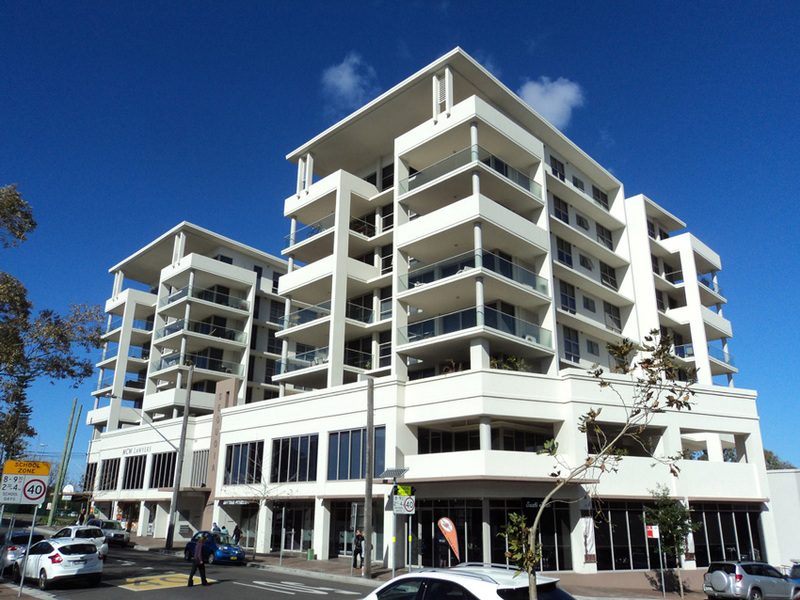 Chloride Resistance Performance: Testing carried out at the University of New South Wales, Australia by the Australian Centre of Construction Innovation demonstrated that concrete integrally treated with crystalline technology reduced the diffusion of chloride ions. 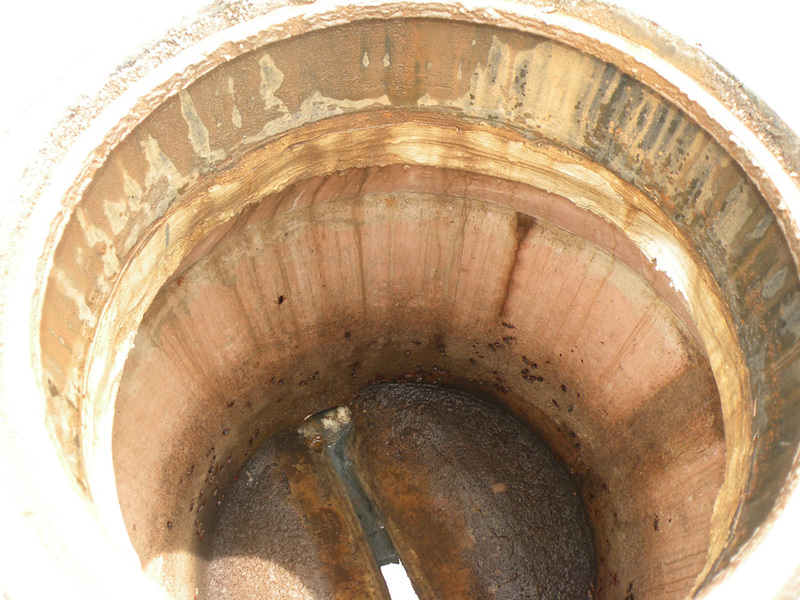 The specific performance was such that calculations based on estimated service life showed a doubling of the expected time to corrosion when compared to an untreated control mix. A separate effort at the University of Wisconsin-Milwaukee was based on field testing of nine bridges that had been treated with various corrosion mitigation strategies, including surface sealers and three different admixtures. At a 2-in. depth, the crystalline technology-treated bridge section showed an average 55% reduction in chloride content as compared with the control section, indicating a very strong level of protection. Test results have shown that crystalline technology dramatically decreases the amount of sulfate that penetrates into concrete. 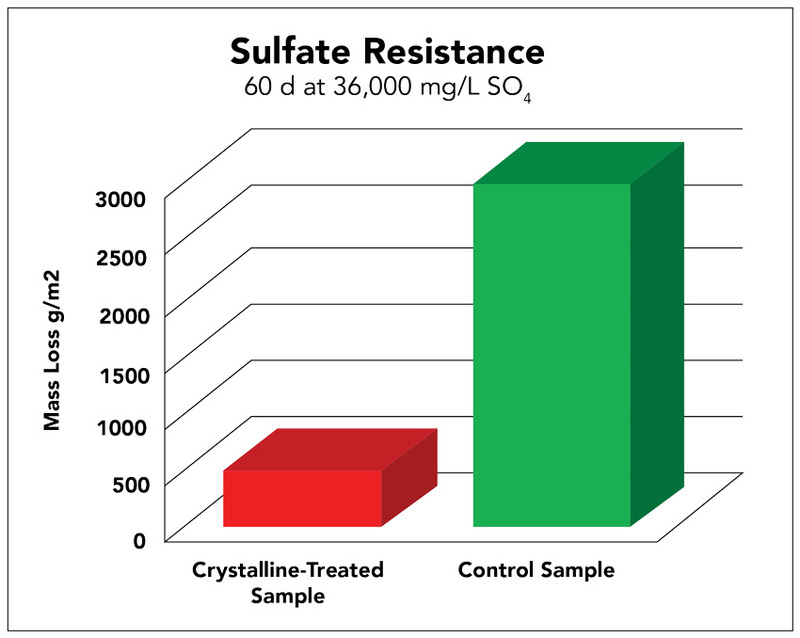 Sulfate Resistance Performance: Testing has shown that concrete that has been treated with crystalline technology has an enhanced resistance to chemicals where the pH range is from 3 to 11 in constant contact and 2 to 12 in periodic contact. Both sets were subjected to a solution of 5% H2SO4 (pH 0.7) for 100 days. The crystalline technology treatment suppressed the erosion of the concrete mortar to 1/8 that of the untreated specimens. Testing for sulphate resistance per AS2350-14 showed the beneficial effect of crystalline technology on both fly ash and slag cement concretes, with reductions in sulphate expansion ranging from 27% to 58%. Overall Durability: In addition to visual evidence of the effect of the crystals in the form of electron microscope images, both independent permeability and chemical resistance studies attest to the ability of crystalline technology to greatly extend concrete structure service life. The biggest sustainable result of using crystalline technology in concrete is increased durability and longevity of concrete structures. That longevity means there is likely less maintenance and repair work, and less need to replace a damaged or deteriorating structure. Less repair and replacement means less need for new materials and energy to create more concrete. All of this leads to dramatically improved sustainability compared to conventional, porous and permeable concrete. Concrete that incorporates crystalline technology is more durable and sustainable whether used for buildings, infrastructure or other purposes. The best method used to determine the degree of sustainability of any material is to conduct a life-cycle assessment that addresses extraction of raw materials, transporting them, processing them (particularly with energy), incorporating them into structures and finally recovering them at the end of the service life of the structure for either recycling, reuse or disposal. National and international standards have been developed for conducting, such a life-cycle assessment that begin with product category rules (PCRs) for a particular type of material or product. ASTM International has produced just such a document for assessing cement, known as UN CPC 3744: Portland, Blended Hydraulic, Masonry, Mortar, and Plastic (Stucco) Cements. This document can be used by cement manufacturers to produce an environmental product declaration (EPD) that identifies the specific environmental impacts of their product. Those impacts are presented in terms of environmental, energy and material/waste effects from using the product. By requesting EPDs from different cement manufacturers and comparing the results, engineers and others can determine the differences in the short- and long-term environmental impacts of those products. Many who have looked at portland cement, concrete and sustainability have determined that the long-term benefits of the material can be shown to outweigh initial impacts of producing it, thus producing a more favorable life-cycle assessment. Integral waterproofing using crystalline technology goes beyond the normal EPD criteria in that it protects concrete against water and chemical intrusion, thus enhancing durability and lengthening the life of concrete structures. It can also eliminate the need for separate membranes that may have characteristics that lead to concern over their environmental or human health impacts. Altogether, concrete, particularly durable crystalline technology concrete, can contribute to green and sustainable structure designs in several ways. In site work projects, durable concrete that can control or resist water will hold up better and provide better functionality than concrete that is prone to deterioration. Concrete that is prone to wet conditions is a particular concern that can be addressed with crystalline technology. Further, concrete pavers that are designed to allow rainwater to percolate into the soil naturally helps to promote better drainage for more sustainable sites. If concrete is used in buildings with conditioned spaces, it can provide thermal mass which, when designed appropriately, can improve overall energy performance. Regardless of the project type, many concrete mixes incorporate recycled or reclaimed materials as substitutes for stone aggregates. This avoids new material extractions and all of the environmental and energy impacts associated with them. In particular, the use of fly ash or slag in concrete mixes has been seen as a positive way to harvest and neutralize some otherwise problematic products of coal combustion and steel production. These can provide desirable substitutes for aggregate and even for some cement depending on the chemical makeup. Crystalline technology has been used successfully in these mix formulations with similarly impressive performance results. Further, embedding these materials into concrete structures for a useful purpose removes them from stockpiles that have the potential for damaging the environment. Locally produced materials and products are another hallmark of sustainability that makes sense here. Concrete ingredients and mixes by their nature are best produced locally. This not only helps control the cost of transporting heavy materials, it also reduces the energy used in transporting them. Less energy used means less environmental impact. Based on all of these attributes and a full life-cycle assessment, architects, engineers, cement manufacturers, concrete mix companies and construction operations can all address green and sustainable attributes of projects by selecting the most appropriate cement and concrete formulations. Durability of concrete depends on many factors, but perhaps the most significant is the porosity and permeability of concrete. The diffusion rate of aggressive substances is controlled by lowering the permeability of concrete. Lower permeability makes it more difficult for water and corrosive agents to penetrate the concrete. Crystalline technology has been demonstrated and well documented to turn concrete into a waterproof material that will resist many common causes of deterioration and corrosion. 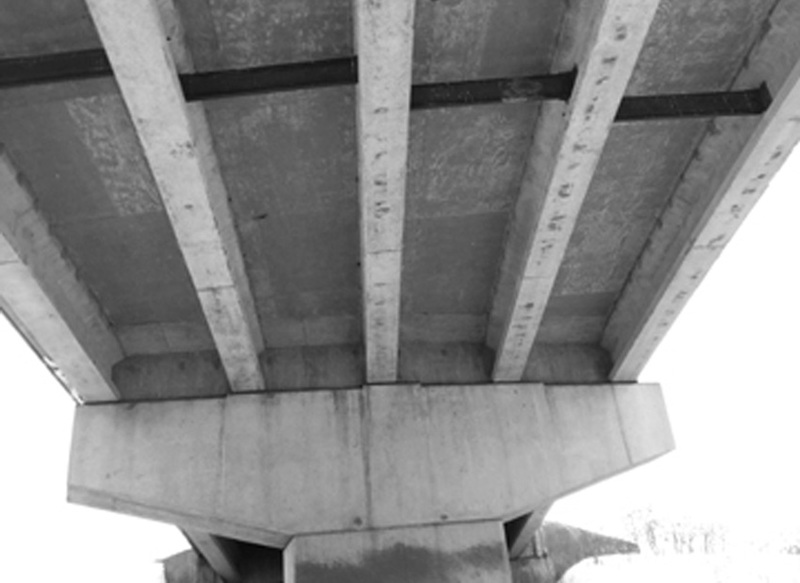 Multiple test results have demonstrated that crystalline technology significantly enhances the quality and watertightness of concrete, particularly in extreme exposure conditions. Concrete products have been enhanced using the proven performance of crystalline technology. In the year 1999, crystalline technology was utilized in the manufacture of approximately 30 precast manholes for the Clinton Street Sewer Collection Project in Terrebonne Parish, La. The crystalline technique was specified to produce an integral waterproofing for the concrete that was expected to be continuously exposed to liquids. The crystalline treatment also met the specification to provide chemical protection against degradation of concrete surfaces exposed to acid and sulfate attack. In order to achieve easy identification and verification of the manholes treated with the crystalline technology compared to those that weren’t, a crystalline admixture with a red pigment was used. In August of 2010, the red, crystalline manholes were inspected to determine how they were holding up against the rigors of their use. They were all found to be in excellent condition, showing no signs of deterioration whatsoever after more than 10 years of service and exposure to liquids, solids and chemicals.